Bonaire, September 2015 ~ Although our tally shows that we saw a number of species spawning last month, the September coral spawning event was just not very robust compared to past years (others who dive regularly in Bonaire agree). One of the things I had on my wish list was spawning Flower Coral, Eusmilia fastigiata, but this year, I never managed to catch any in the act of spawning. I have footage from our observations in previous years but I had hoped to fill in gaps. It didn’t happen, so I’m sharing what I have. I first saw Flower Coral spawn years ago in the Florida Keys when Lauri MacLaughlin, a resource manager with the Florida Keys National Marine Sanctuary, pointed it out to me. 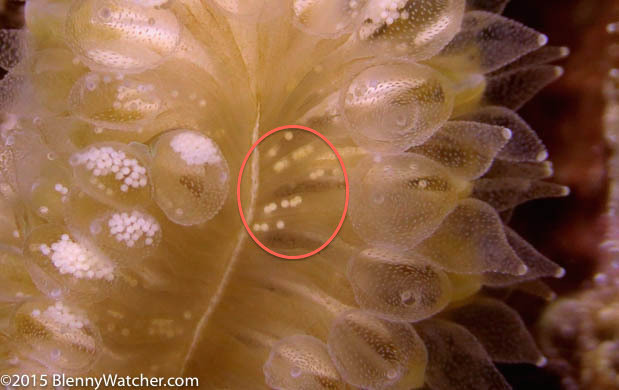 We were on a mission to see other corals spawn so I didn’t take the time to set up my video but what I remembered most was how clearly I could see the little round “eggs”, collecting in the translucent tentacles of the cup-shaped corallites, long before they were actually released. One of the things we look for in spawning coral is the “setting” of the eggs or egg/sperm bundles. We say the coral eggs are “setting” when they become visible to us, usually in the mouth of the coral polyp. Corals, like the Staghorn and Elkhorn (genus Acropora) and some star corals will set about 30 minutes prior to release. With many other species, the setting isn’t as apparent until shortly before the release. During coral spawning week, we try to be conservative with our diving because so much happens between 7:30 and 11:30 p.m. and we want to be underwater for as much of that time as possible, so the shallower the dive, the better. In Bonaire, we usually work a reef where the Flower Coral colonies are between 40 and 50 feet deep. If I spend a lot of time at 50 feet then that cuts my total bottom time short for the evening, plus I don’t want to be sprinting to shore to change tanks right when something exciting, like spawning brittle stars, starts (that was a bitter experience in 2009). While some things are fairly predictable, there are no guarantees and to complicate matters, spawning corals have to be in spots where I can set up my tripod without damaging any reef. Oh, the calculations and decisions! So, we spend a lot of time cruising around the reef, looking for signs of spawning and often getting distracted by things other than spawning corals. This year, I was determined to bypass all other spawning and look for one thing only, Flower Coral, but I never found any with setting eggs. Bummer. But that brings me to the eggs. 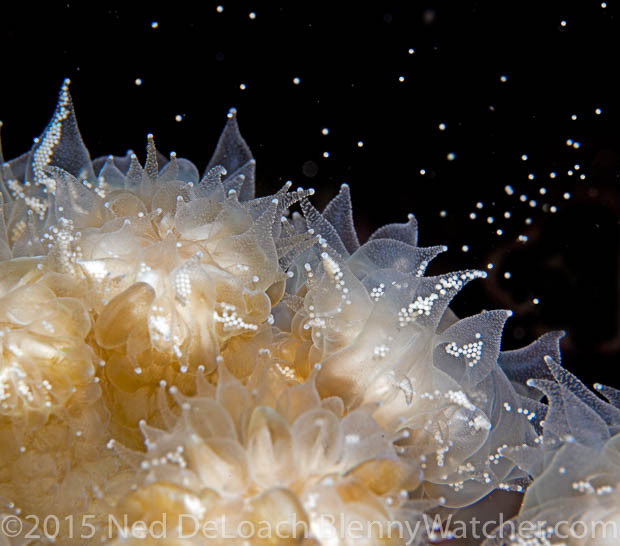 For years, I have been calling the tiny white spheres in the clear tentacles of the Flower Corals, eggs. 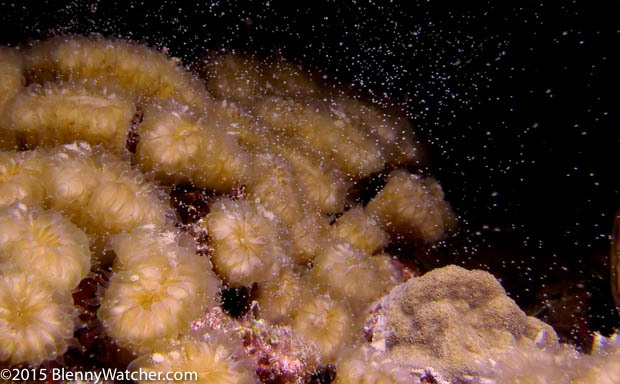 Well, they are technically not eggs because this species of coral is a brooder not a broadcast spawner. This means we are looking at female colonies, whose eggs have already been fertilized and the little round spheres we see in the tentacles are zygotes, already on their way to becoming planula larvae. 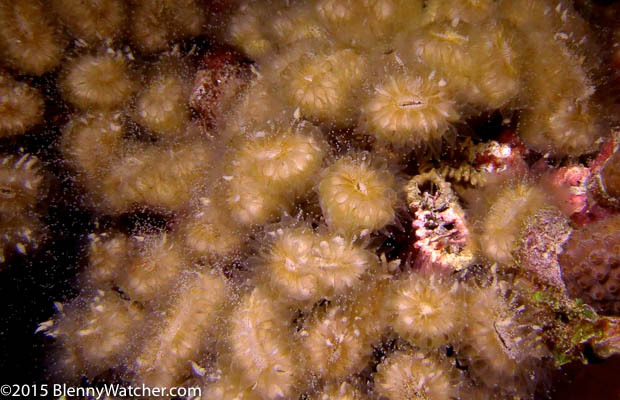 A 1999 paper documented that unlike other brooders that release well-developed planula larvae, The Flower Coral releases zygotes in “early developmental stages”. Not to digress too much, but an example of a broadcast spawning species is the Giant or Great Star Coral, Montastraea cavernosa. Male colonies release sperm into the water and about fifteen to twenty minutes later, female colonies release clumps of eggs that hopefully meet up with the sperm, become fertilized and become planula larvae that find a good spot to settle and become new coral colonies. 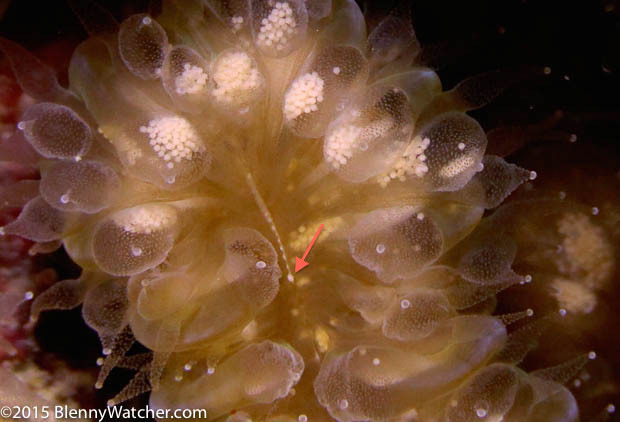 That same paper observed that the Flower Coral released its supposed gametes (they still thought they were gametes at that point in their paper) from the tentacles of its colonies. Ever since I read that, I have been trying to see them released from the tentacles but all I have been able to observe is the zygotes being released through the mouth of the corallite. In fact I have seen them gather in the clear tentacles (the swirling movement is quite beautiful) then move down small canals to the mouth. In my video, you can see the zygotes exiting the mouth and I have even gotten close-ups of a few individuals being released through the mouth. I finally had a chance to talk to our friend, Ellen Muller, who assured me that Flower Coral releases the zygotes through the mouth. Has anyone else ever observed release through the tentacles? We’d love to hear from you.